Can I Wear All My Crystals Together? Hello. I wanted to know if it is safe to wear Clear Quartz, Amethyst, Lapis Lazuli, Turquoise, Chrysocola, Jade, Tiger Eye, Carnelian, Red Coral, Garnet and Black Agate all together? Please advise me what to do if I want to wear different stones for chakra healing and protecting myself from black magic.. Thanks. Thank you so much for your question about whether it is alright to wear different crystals together. Specifically you asked if it was safe to wear Clear Quartz, Amethyst,Lapis Lazuli, Turquoise, Chrysocolla, Jade,Tiger Eye, Carnelian, Red Coral, Garnet and Black Agate all at once. 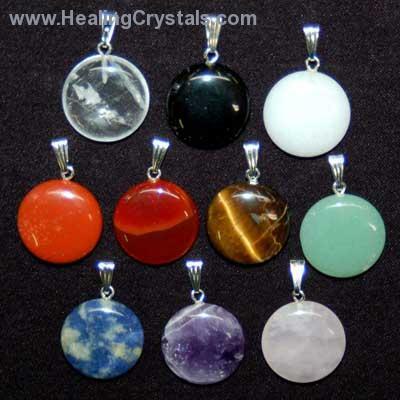 It is certainly safe to wear and or carry these crystals all at the same time as long as you feel comfortable with all of them. You do have a variety of energies with these crystals and some will keep you grounded while others will offer insights and energy from higher planes. Some people are concerned that when you mix so many crystals that they might "cancel" each other out. While I do not believe that a crystal will compromise another's energy I do believe that at different times you may need more of one type of energy than another. There may be times when you feel that you intuition is not as strong as usual and then the Amethyston it's own might be more balancing. Perhaps you need to get in touch with your emotions and open your Heart Chakra so you would want to focus on Jade. I am very sensitive to all kinds of energies so I always have to carry a grounding crystal. I always have Black Obsidian with me even when I am not carrying or using any other crystals. You are the best judge of what is working for you and I suggest that you experiment with your crystals. Maybe just carry Lapis Lazuli with you for one day and see how it feels without the others. Thanks so much for your question and for your support of Healing Crystals.com. Please let us know if you have any other questions and I hope that you enjoy your crystals.